This is not a new mold by any means, but it is my first Scalextric version of this car. Since I am not really a huge fan of modern GT in any class, these cars just seem to take a back seat (ahem) to other releases. But my recent collection of them are growing and it made sense to add it. This car still maintains the sidewinder chassis design rather than the new inline approach Scalextric has been taking with newer releases. This might be good or bad depending on your personal taste. For my track, the motor configuration is not really a factor. On the outside the car is well done and is a very close match to the prototype. These are not tampo stamped markings, this a decal type method that Scalextric calls “water labeling” and it does the job. Especially on models that the designs would be extremely difficult, if not impossible to accomplish with traditional Tampo stamping. The outside looks fine for my hobby dollar. 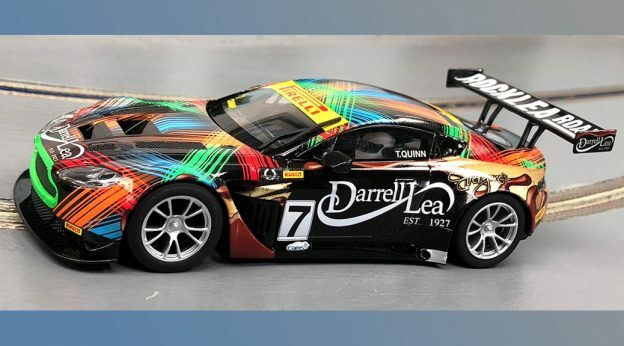 It is one wild scheme to produce and any fans of the 1:1 car should be pleased. Nothing is ever perfect, so only you can decide. For me? Yeah, I like it and it will be raced. That wing is a big one and not surprisingly it won’t take a lot of hard knocks before breaking. But that is just the chance you take in or hobby when we want scale appearance. Hopefully it can last a while even in my hands! As we mentioned, it is still the sidewinder configuration with standard bar magnet behind the motor. Digital plug and play for the Scalextric system and solid front axle configuration. And additional/alternative magnet pocket is seen in front of the motor. Standard gear ratio here. There is a bit of side to side freeplay in the rear axle. And some freeplay in the bushing to axle fit. But very common on all these models. Not a deal breaker for myself or the tuners I race with. Out of the box in runs fairly well, especially on plastic track with magnet in place. The working front and rear lights adds some visual appeal if you appreciate them. 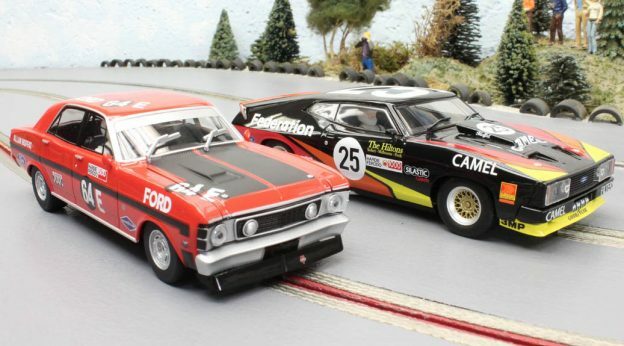 Just as it is, it’s a decent slot car for a fair price and would compliment any modern GT collection. This entry was posted in Product Reviews on February 2, 2018 by admin. Ford, Bobby Unser, Smokey Yunick, Holman & Moody. These legendary names came together in 1969 for a record-setting effort at the Pikes Peak Hill Climb. If there was a truly unique car for Carrera to choose to model, this one certainly qualified. For those that enjoy the history of our models, take the time to watch this priceless interview. It just doesn’t get much more classic than this. No, it’s not a car that flew around the high banks of Daytona but it seemed to have wings on that famous mountain in 1969. Carrera has done a good job in giving us this car in our scale. Nothing is perfect but I feel the effort represents the car well enough. No matter how many years this mold from Carrera has been with us, it just never gets old to me. I just do not take for granted classic American cars in our hobby. Then they produce a car with this kind of history behind it and I can’t help but appreciate it even more. And although it was not an oval racer, you can bet that is exactly where I will race it. We already race completely fictional schemes alongside scale efforts, why stop now? In our scale world anything is possible. Great job Carrera. I truly appreciate this classic Ford. Support those who support YOU through articles like this. This entry was posted in Slot Car Overview on September 7, 2017 by admin.